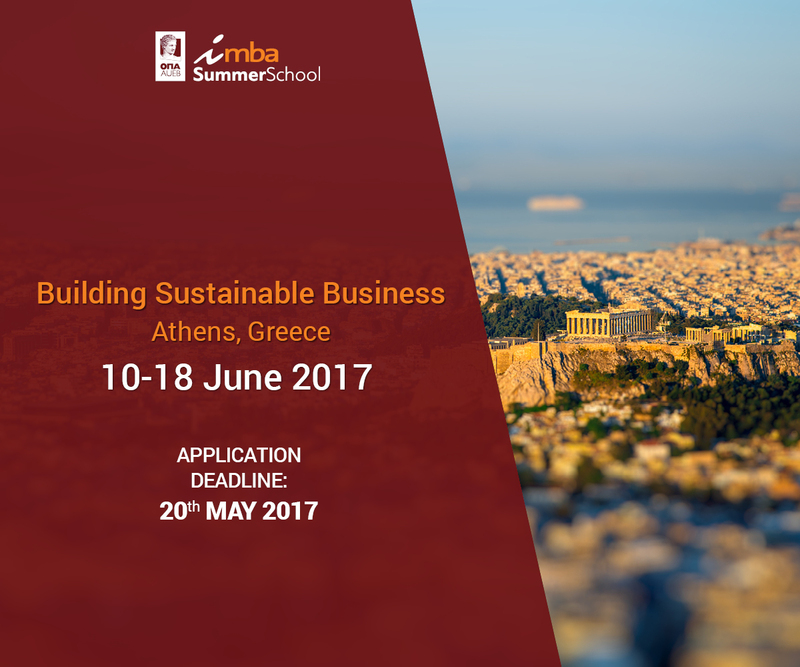 i-MBA invites highly motivated University graduates and postgraduate students from all around the world to participate in the i-MBA Summer School on Building Sustainable Business, which will be conducted June 10 – 18, 2017 in Athens, Greece. Today’s implementation of sustainable business models and ultra-efficient processes are becoming increasingly important for businesses hoping to maintain their competitive advantage. Sustainability in design, product development, production, and logistics are the focus of agendas in virtually all industries today. The i-MBA Summer School -following a carefully crafted curriculum that involves lectures, executive talks, and company and cultural visits structured around the blocks of Economic Context, Sustainability, Technology, Culture and Leadership, and Innovation- will help participants accelerate the process of becoming more enlightened, effective managers and leaders in the strategic sustainable restructuring of companies and organizations irrespective of sector of activity, size, geographical location, and market reach – local, regional or global. Successful completion of the program will also grant students the equivalent of 3 ECTS credits, which can be used towards their current degree completion. The i-MBA Summer School will be hosted at the Ionic Center in Plaka, the heart of the city’s historical and cultural center. Therefore, participants will be able to enjoy a wonderful summer experience in Athens, one of the most exciting cities of the Mediterranean, and in its breath-taking surroundings. Now a modern and cosmopolitan hub, Athens combines culture, history, entertainment, and beautiful weather, making it a fantastic destination for students’ summer studies. To learn more about the program, we invite you to visit its website or contact us at imba@aueb.gr and +30 210 8203659. Applications will be accepted until 20 May 2017.